Our Orlando Personal Injury Lawyers have represented hundreds of people that have been injured in both Orlando, Florida and throughout the state by no fault of their own. Our lawyers are available by appointment to meet with you at our Orlando office, your home, the hospital or at a location that is most convenient for you. In 95% of the Orlando, Florida accident cases that we handle our accident attorneys can tell you within a matter of minutes whether you have case. The best way to know if you have a case is to call us for a free phone consultation. Whether you are an Orlando resident or were injured in Orlando, our attorneys are available to discuss your recent accident. Orlando, Florida is much more than the Happiest Place on Earth. Besides containing Disney World, Universal Studios and a range of other amusement parks, Orlando is the 79th largest city in America and the fifth largest city in Florida. 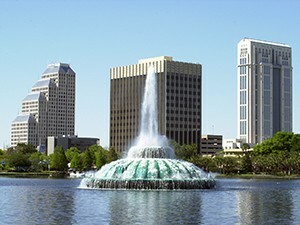 Orlando attracts massive amounts of tourists each year, which make tourism a major sector of the economy. With a vibrant population of over 238,000, Orlando’s roads serve this massive population as they commute to work. Running through Orlando is Interstate 4, which is constantly ranked one of the most dangerous roads in America. In 2010 alone, I-4 was ranked the thirst most dangerous road due to 209 fatal accidents occurring along its 132 mile long path in Florida, which equals out to one fatal accident for every 1.58 miles travelled. Additionally, due to the temperate climate and family friendly areas, residents enjoy an active lifestyle, including motorcycling, bicycling, running, amusement parks and other outdoor activities. At times, these activities can turn dangerous and unfortunately, accidents do occur. As such, there are many hospitals to serve the population, including Florida Hospital Orlando and Orlando Regional South Seminole Hospital.